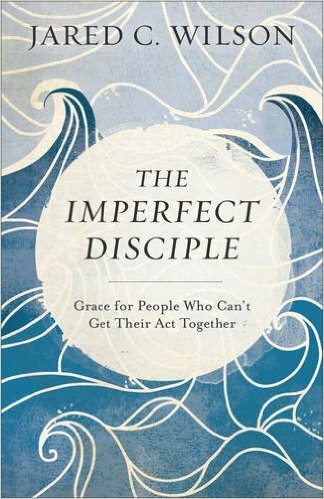 Now by popular demand, I’m making available a free study guide for my book The Imperfect Disciple: Grace for People Who Can’t Get Their Act Together. I’ve been greatly encouraged to hear how many folks have been using the book in their small groups, book clubs, and church classes, and I hope these suggested questions will help. Each chapter comes with a set of questions for Personal Reflection and a set for Group Discussion, but obviously readers are welcome to use both sets in either reading situation. Full text of the guide is below the fold. Or you can download a pdf at the book’s page on my website here. Please feel free to use in any way you see fit and make as many copies as you’d like. 1. Reflecting on Romans 7, what is something you struggle to do even though you know it’s right? 2. How can the truths of Romans 8 help you follow Jesus in this area of struggle? 3. Do you struggle to share the gospel with others? If so, why do you think that is? 4. What areas of your inner life do you most hope God doesn’t want to deal with? Why? 5. What do you think it would look like for you to “go deeper” in your discipleship? 1. What has been your experience with the way churches “do discipleship?” 2. What are some evidences that you wake up in the morning in self-sovereignty mode? 3. What has been the single greatest help to you in sharing your faith with others? 4. How can we combat the fear that God is always disappointed in us? 5. Why is studying more secondary theological matters often an exercise in missing the point when it comes to going deeper in our discipleship? 1. Do you agree that most of the problems you have are old problems? Why or why not? 2. What parts of the Sermon on the Mount make you the most uncomfortable? Why do you think that is? 3. Is it easy or difficult for you to think of yourself as a “loser?” Why? 4. What is it you’re afraid of turning over to Christ’s Lordship? 1. How would you react if Jesus called you a dog? 2. Read the Beatitudes together. Which specific blessing(s) resonates with you the most? 3. How does knowing Jesus is for you change the way you view the world? 4. Why is shame such a powerful force in our lives? 5. What can we do to help others see Christ’s grace in the midst of their shame? 1. What is keeping you from fixing your gaze on Christ? 2. If you were Satan, what would you do to keep you from seeing Jesus every day? 3. Why is beholding often more difficult than behaving? 4. Knowing that we’ll war with sin our whole life can be discouraging. What encouragement from God’s word can help you persist in the fight? 5. Thinking of an area of sin in your own life, what is it that you are tempted to worship instead of Jesus when this sin tempts you? 1. What daily practices/routines do you engage that obscure the glory of Christ in your vision? 2. What practices/routines can you adopt that can help you “stare” more at Christ’s glory? 3. Describe a time in which you felt particularly close to God. What were the circumstances? 4. Why does the biblical reality that it’s the gospel that transforms our behavior so counterintuitive to so many? 5. Do you agree that sin problems are worship problems? Why or why not? 6. Can you describe a struggle with sin in your own life that is directly connected to worship? 1. Why is it so difficult sometimes to hear from God? 2. Dallas Willard says, “Grace is not opposed to effort but to earning?” How does this change the way you view the place of obedience in the Christian life? 3. Does your environment—home routine, neighborhood, workplace, schedule—help or hinder your ability to hear from God? How? 4. How does your perception of what the Bible is affect how you read it (or don’t)? 1. What do you think about old hymns? 2. Do you ever struggle with believing God is speaking? Why or why not? 3. Do you agree that the suburbs can stifle our ability to hear from God? Why or why not? 4. What does the desire to hear from God apart from the Scriptures reveal about us? 5. How can we help each other esteem God’s word and persevere in our reading of it? 1. How does hurry affect your ability to walk intentionally with Jesus? 2. What is at the root of prayerlessness? 3. Do you ever think of prayer in terms of efficiency or immediate effectiveness? If so, what does this say about your view of God himself? 4. Why does prayer seem like such a burden sometimes? 1. Do you suffer from “hurry sickness?” How do you know? 2. Do you struggle with a consistent prayer time? Why or why not? 3. Why are guilt and shame such powerful inhibitors of prayer? 4. Describe a time when you heard a public prayer that was particularly meaningful to you. What was it about the prayer or the praying person’s voice or demeanor that impacted you? 5. What difference does it make to know the Holy Spirit is empowering and involved in our prayers? 1. Even knowing how beneficial church community is, why is it so tempting to keep “doing discipleship” on our own? 2. Is going to church a difficult thing for you? Why or why not? 3. Do you think you expect more out of your church’s commitment to you than out of your commitment to the church? Why or why not? 4. Are you afraid to confess some sins to your brothers or sisters? Why or why not? 5. What are some ways you can encourage your pastors/leaders on a regular basis? 1. Why is authentic community so difficult to experience? 2. What are some illusions of community in your neighborhood? 3. In what ways can we “play at community” at church without actually engaging in deeper fellowship with one another? 4. In what ways can we push past the illusion of community in our church to experience the real thing? 5. Does the idea of submitting to leadership make you uncomfortable? Why or why not? 1. Do you ever feel stuck? What are the circumstances in which this most often happens for you? What is it that eventually makes you feel “unstuck?” 2. If Satan wanted to get you really off the discipleship track, with what would he tempt you? 3. Looking over the fruit of the Spirit, which quality do you think you most excel in? Which quality do you most lag in? Why do you think this is? 4. How does Jesus exhibit the fruit of the Spirit? Be as specific as possible, thinking of moments from his ministry in the Gospels. 1. How is joy perhaps different from happiness? 2. Why is it sometimes difficult to think of joy as a command to be obeyed? 3. Describe a time when you were particularly aware of the kindness of God in your life? 4. What is so often the problem with “being good?” 5. How are you doing when it comes to displaying the fruit of the Spirit? Chapter 8: Will the Real Me Please Stand Up? 1. When all is said and done, do you feel known? Why or why not? 2. Do you agree that we behave out of what we believe—about God and about ourselves? Why or why not? 3. What, if taken away from you, would cause you a crisis of identity? What idol is at work in that way of thinking? 4. What accusation from the enemy do you hear most often in your head? 5. What promise from the biblical gospel can you use to specifically rebuke that accusation? 1. What words or labels from your past (or present) have impacted your self-worth or identity? 2. What are you afraid of? Why? 3. Deep down we all desperately want to believe that God loves the real us. So why do we so often struggle with actually believing it? 4. The gospel is on audio. What messages do you “hear” on video every day that tend to overpower the good news in your heart? 5. What does the reality of Christ’s cross say about God’s disposition toward us? Chapter 9: Does Grace Go All the Way Down? 1. Have you or has someone you loved struggled with depression? Why is it so difficult to believe the good news in the midst of it? 2. What is your deepest need, and how does the gospel speak to it? 3. What is your darkest secret, and how does the gospel speak to it? 4. What is your greatest pain, and how does the gospel speak to it? 5. What is your greatest worry, and how does the gospel speak to it? 1. What does it say about us that in moments of crisis we most often want God to “puff us up” rather than remind us of his presence? 2. Describe a time you experienced or witnessed the ministry of comfort in the midst of profound suffering? 3. How does suffering reveal who we really are? 4. Is the notion of the sovereignty of God over suffering comforting or discomforting to you? Why? 5. Paul prayed that his thorn would be removed. God said no. Describe a time when God said no to one of your prayers and how you discovered through the experience that his grace was sufficient for you. 1. Why is it so difficult to believe without seeing? 2. Why is it a waste of even a good gift if we don’t enjoy it less than we enjoy its Giver? 3. Do you think about heaven every day? Why or why not? What difference does it—or would it—make in your life? 4. As you finish the book, reflect back on what you’ve read. What has been the most meaningful or personally helpful portion you’ve read? Why? 1. What are some earthly joys or gifts of common grace in the world that help you trust and enjoy God? (ie. What are some of your favorite things?) 2. How should the reality of heaven affect the way we live right now?—how we treat others, how we work our jobs, how we think of our church. 3. Finishing the book, what are your thoughts on the general approach to discipleship presented? Did you find the book overall helpful? Why or why not? 4. What was your favorite section or passage of the book? Why? 5. What would you say is the relationship between the good news of the finished work of Christ and the sobering news that there is no such thing as a perfect disciple? What Does Job 31:13-15 Tell Us About the Unborn?